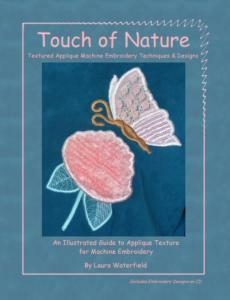 This booklet with its CD of machine embroidery designs shows you that even the simplest of applique machine embroidery designs can be transformed into uniquely wonderful, rich fabric art. The community of embroidery artists offer many machine embroidery designs on the theme of nature. Some such designs, with their detailed fill stitches and numerous thread changes, can create very realistic and unique images. Touch of Nature takes a different approach, by lifting the details of the applique off the surface of the fabric to give the embroidery depth and texture. The projects shown here accomplish this feat through the use of textured fabrics, pintucking, a novel concept of creating fabric collages, and much more. These projects also create textured appliques as PATCHES which you may audition onto your project before applying them to that favorite dress or pant suit.